They say there is no “neutral” in life. You either go forward or you go back, but you never stay where you are now. I learned this from my former boss at the White House. Our days were always dynamic, and political pressures continually pushed us outside of our comfort zones. Unpredictable events surfaced everyday and we found ourselves learning, adapting, reframing, and steering the issues to the most favorable outcomes we could imagine. It was a tough environment. This experience taught me that the opposite of discomfort is complacency. Complacency is an attitude that we develop when we enjoy prolonged comfort. We become so self-satisfied, so smug about our own well-being, that we remain unconscious of the dangers that may lie ahead. What does complacency look like in the work world? Over time, our behavior and work patterns become habitual and focused on preserving things the way they are, giving us a false sense of control. This phenomenon afflicts individuals as well as organizations and, in both cases, adverse consequences evolve so gradually that we become numb to what’s happening. One cannot learn, grow, and develop in a culture of complacency. If we are too cozy with our success, we risk squandering the ability to break away from what we think of as a tried-and-true way of doing things. 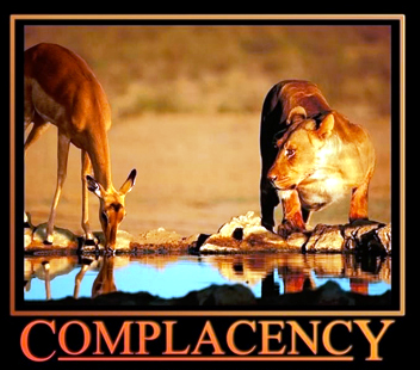 Complacency leads to risk-aversion, missed opportunities, and even boredom. We limit our chances to experiment, innovate, and to make new connections. Since its founding in 1888, Eastman Kodak was known for its dominance in photographic film. The brand became mainstream and having a “Kodak moment” was synonymous with good times. These moments were worth capturing and preserving for posterity on, of course, Kodak paper. At times Kodak’s market share was hovering around 90%, a total and complete dominance of the market. So, why change? We now know the answer. Kodak became anchored in its success, complacent about the future, ignoring technological developments, even those developed in-house. It was a young Kodak engineer who invented the digital photographic process back in 1975, but his bosses could not envision a camera that did not use film or paper. Even two weeks before filing for bankruptcy, a Kodak executive said to a colleague, “I think film’s coming back.” But it never did. Regrettably, Kodak’s inability to cope with technical innovation led to its bankruptcy in 2012. Kodak had invented the future but did not have the appetite to embrace it. It could not imagine the potential of digital photography because it was blinded by its dominance. Moving beyond current successes is never easy, yet it is essential for individuals and organizations seeking long-term competitiveness. The lessons from Kodak are profound and are reinforced by what evolutionary biologists have taught us about ourselves. The more comfortable we are in our current environment, the less likely that we can adapt to a new one. 1. Ask yourself, when was the last time that you did something completely new or different? If the answer takes too long for you to articulate, chances are that you are experiencing complacency. 2. Nurture your curiosity and look for new connections by reading material outside your domain and interacting with people outside your field. This will help you to view problems and solutions from other points of view, other disciplines, and bring uniqueness to what you have to offer. 3. Use the telescope, not the microscope. Don’t let the micro details of today prevent you from seeing the big picture ahead of you. Doing so will help you pull the possibilities of the future into the present and unleash yourself from the trappings of today. To survive on a personal or organizational level, it is essential to rethink, reimagine and redesign our businesses and ourselves when we are in the midst of success. It is at this very point in time when we can indulge in the luxury of reflection and invite discomfort and unease into our thinking. Continual development and learning can no longer be just strategic choices, but strategic necessities to help us move forward.